In a shocking video, a young couple in Kolkata was allegedly beaten up for hugging in public in Kolkata Metro. Following the outrage against public vigilantism, Metro Railway, Kolkata, through its social media channels, issued a statement that while no complaint has been registered, the department is looking at going to the bottom of the incident. However, in what is now a deleted comment on the above post, Kolkata Metro was seen defending the act of mob vigilantism of commuters beating up the young couple. 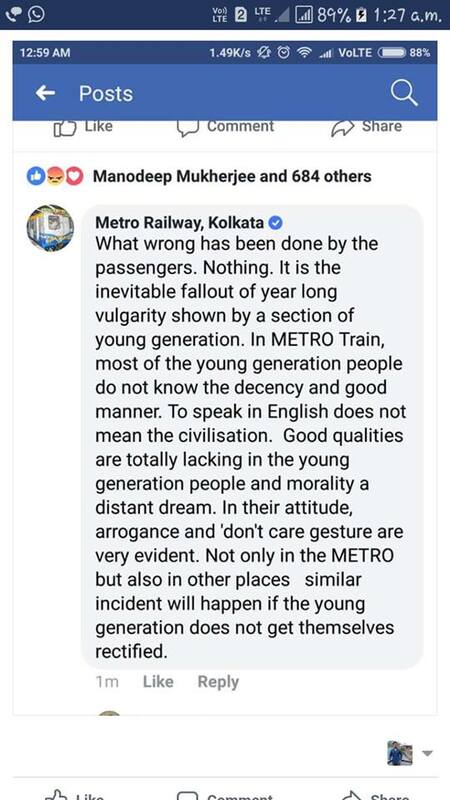 The comment posted by the verified account of Kolkata Metro, one can read how it justifies the act of co-passengers by claiming it is the fallout of ‘vulgarity’ shown by the section of youth which ‘does not know decency and good manners’. Displaying more moral policing, the Metro Rail is seen to be saying such incidents will continue to happen if the younger generation does not ‘get themselves rectified’. Many took to Twitter to express their anguish over this defence of vigilantism and even asked Kolkata Metro to confirm whether such a comment was indeed published by them. While the comment now appears to have been deleted, Kolkata Metro has not yet denied making such a comment. Sporadic instances of violence have been reported from West Bengal during the third phase of the elections where poll-related violence has been the norm. Shah alleged that a false case against Sadhvi Pragya was filed to malign the Indian culture before the world.